QLD1×6x series are single mode DFB lasers with high power capabilities in a 1000 to 1180nm wavelength range. These lasers are mounted in a standard 14pin butterfly package with an optical isolator. The package is pigtailed by a polarization-maintaining optical fiber (PMF). 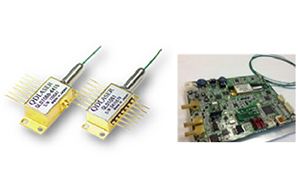 These DFB lasers show excellent single mode stability and are quite suitable for both CW and short pulsed operations. The features are ideal for a seed light of a fiber laser system for precise material processing, gas sensing, SHG (second harmonic generation) applications combined with PPLN (Periodically Poled LiNbO3) etc. Picosecond pulsed driver is available for evaluation and development of psec fiber lasers.